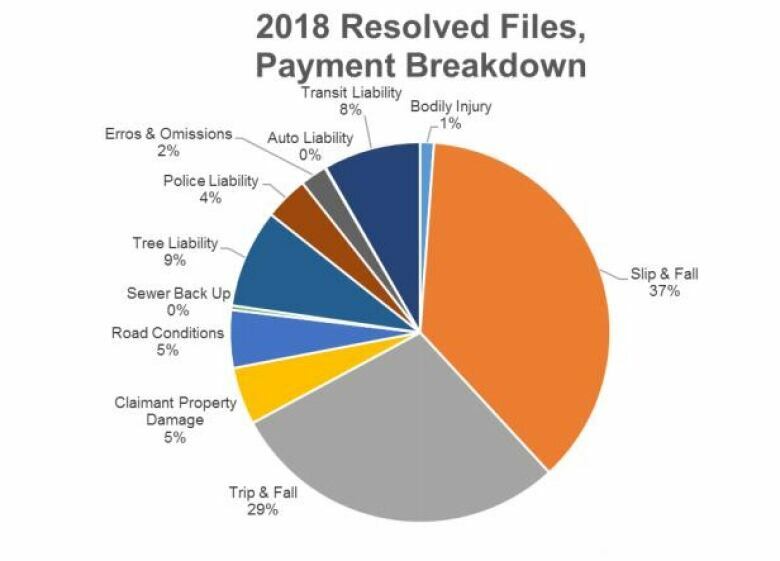 There were 134 more claims against the city for damage due to road conditions in 2018 than there was in 2017. The increase of almost 263 per cent is largely attributed to the intense weather changes in February and March. "The more severe the winter or freeze-thaw cycles, the greater likelihood of slips on ice, potholes and other weather-related claims," said a 2018 year-end report from Dana Paladino, deputy city solicitor. Paladino works in the risk management division at the city, which administers the city's insurance claims. "Basically, [potholes] were popping up instantly in some case," said Paladino. "It was almost inevitable that we were getting these claims. Cars couldn't really avoid them." In total last year, 489 claims were made against the city. They have all been investigated and will either be paid or denied depending on if the city is deemed at fault. According to the city, crews were given increased resources to patch potholes and worked "around the clock," to fill potholes when possible. "Intervening weather events often hindered the patching process, and the rate at which the potholes were appearing was sometimes faster than the rate of filling them," said the report. Provided the city can establish it "acted reasonably in its approach to addressing potholes," there is no liability for damage caused by potholes. Only five per cent of payments made correlate to road conditions, or pothole damage. "With road condition claims, a good portion of them are denied," said Paladino. "We had our crews out all day and night trying to keep up with the demand. We were doing everything we reasonably we could. We were fighting Mother Nature." Paladino said depending on the type of vehicle and tires, a pay out more than $1,000 is rare for a road condition claim. Since 2014, anomalies in claims made against the city connect to flooding events, including a more than 2,000 per cent increase from 2015 to 2016, thanks to the September 2016 flooding. Other than the road condition claims, Paladino said it wasn't a unique year — other claims averaged out to be the same as years prior.